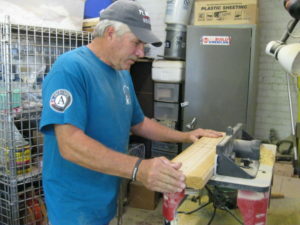 AmeriCorps Spotlight: Mark Barbee - CARITAS - Shelter. Jobs. Recovery. Hope. What That Means: My primary responsibility is to manage the volunteer opportunities that relate to the warehouse workshop, primarily being the furniture builds. Teaming along with volunteers and corporate partners on furniture builds gives me the opportunity to work with the community and serve others who need our assistance. I also help organize other volunteer projects within the Furniture Bank. Background: While living in VA Beach most of my life I attended Old Dominion University as a Civil Engineer major. After three years I realized that was not my calling, and unsure of where my career was going I applied for a job as a UPS driver. I drove for UPS in VA Beach for approximately 10 years. I was promoted to management where I spent the next 18 years in Business Development. As an Account Manager, I went back to school and obtained a Bachelors Degree from Averett University in Business Administration. As an Account Manager, I held many positions each challenging and rewarding. After retiring from UPS, I started a construction company called Sovereign Contracting Group, LLC. As President of SCG, I hold a Class A contractors license and specialize in everything from new construction to remodeling a bathroom or kitchen. Hobbies & Interests: I enjoy building furniture. I also have a deep love for sailing and older Corvettes. Favorite Place I’ve Lived: I grew up in VA Beach, VA. While living in VA Beach I had the opportunity for years to sail up and down the Chesapeake Bay. I spent many wonderful days visiting small towns along the Bay. So many beautiful homes that are scattered along the Virginia, Maryland, and Eastern Shoreline. I Can’t Live Without: My Faith, Family, and the ability to persevere during difficult times. Best Part of My Service Position: Knowing that what we do at CARITAS is helping others in the community. Helping others with a hand-up.